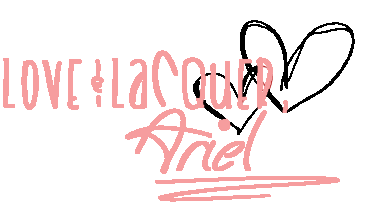 Another special Sunday Glimmer By Erica post today, Lacquerbeanz! 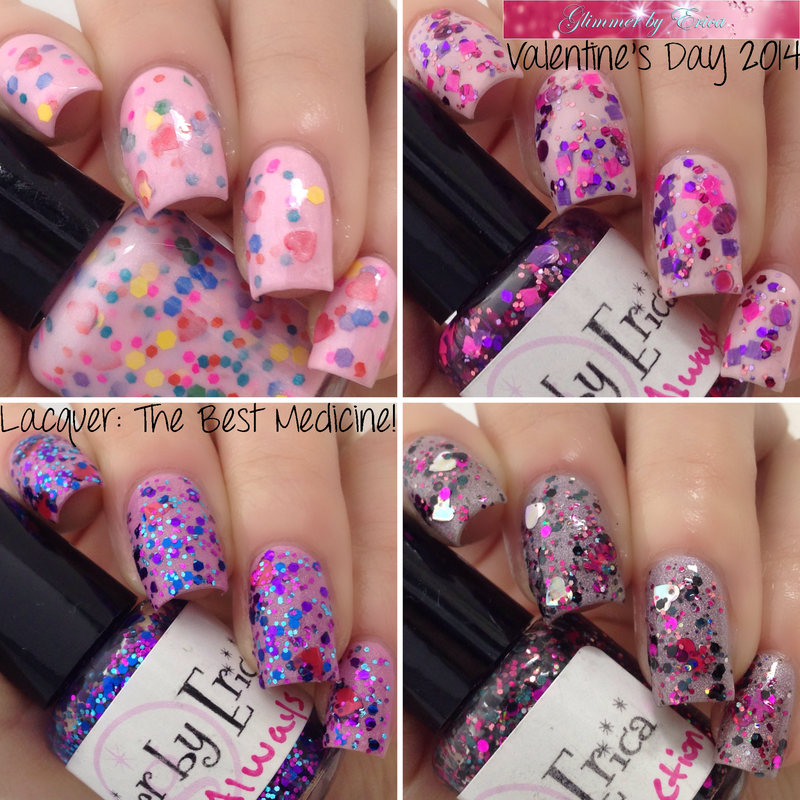 Today I have Erica's beautiful collection of 4 Valentine's Day polishes that are now available in her Etsy Shop. Love Always is up first, and it's a beautiful glitter topper. Application was easy peasy - in fact, the hearts came right out with the first dip of the brush! My swatches show two thin coats over Aly's Dream Polish Bohemian Raspberry. "This is a lovely Glimmer for your Valentine's Day date. It has purple, navy blue, ice blue glitters, and hot pink hearts." Next up is another glitter topper called Wicked Attraction. I LOVE what Erica did with this glimmer! No problems with application for this one - you may need to dip a few times to get the skull & crossbones onto the brush, but that should require too much work. Swatches show two coats of Wicked Attraction over Aly's Dream Polish Prussian Purple. "This Glimmer is for the forbidden love affair, the midnight rondevous, the stolen kisses in the dark....It has black and pink glitter in various sizes and shapes, holographic silver hearts, and hot pink holographic skull & crossbones." The third glitter topper from this collection is called Forever & Always. Great formula and easy application. My swatches show two coats of Forever & Always over Pop Beauty Nail Glam in Pink Popsicle. "This Glimmer is perfect for those who love the day but are sick of all the hearts. It is a clear base with pink and purple holographic glitters, matte pink and purple squares, and holographic pink and purple dots. It's sort of the anti valentine's day polish. =)"
Sweethearts is the final polish of this collection. This one has a shimmery base, and while it probably would look beautiful by itself, I decided to layer it over a pink creme (Priti NYC High Hopes) very similar in color for two reasons: First, my nails are a bit longer than usual, and unless the base is very sheer, my nail line will probably be visible. Second, oftentimes, it's easier to layer glitter polishes of any kind over a solid base color so that you don't have to use as many coats of the glitter polish. Less coats = less bumpiness and shorter dry time! =) My swatches show two thin coats over the pink base. "This soft pink Glimmer is the perfect shade for your Valentine's Day date. 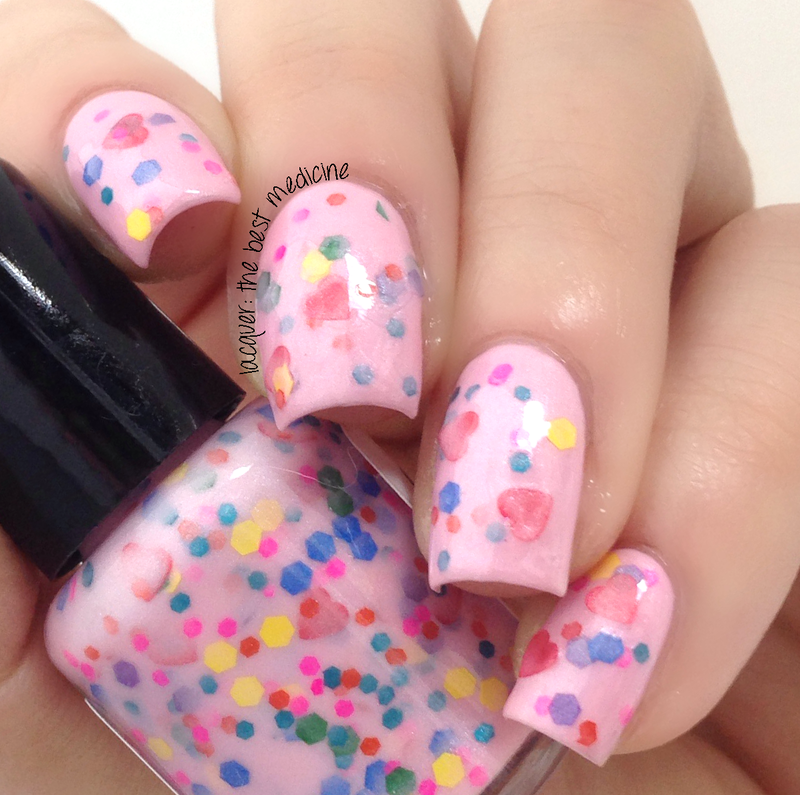 It is a soft shimmery pink crelly base with different colors of matte glitter and hot pink hearts." That's all for today, folks! Which is your favorite? Those are some beautiful glitters! Your swatch of Forever & Always totally created a new lemming for me! So pretty.